Srinagar, Jan 20: Dr Sharmeen, a 40-year old doctor, became the first Kashmiri woman who participated in a snow car rally held at ski resort Gulmarg in North Kashmir’s Baramulla district today. A medical officer at a hospital in Srinagar, Dr Sharmeen’s is also mother of two kids. 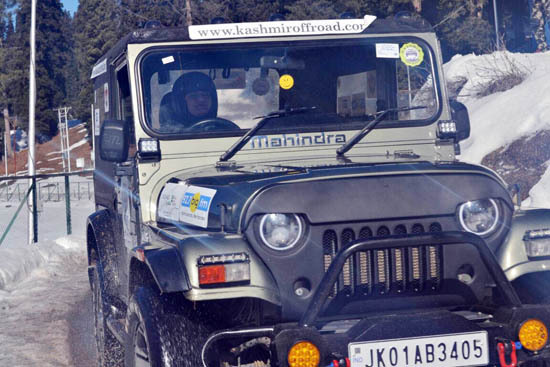 The snow rally organized by Kashmir off Road is a time based lap race in which each car will be allowed two laps in a 1.25 kilometer race track. The winner of the contest will be adjudged on the basis of fastest time lap. Popular ski resort Gulmarg is located at an altitude of above 8000 ft where temperatures can dip to minus 10 degrees and receives more than 15 ft of snow every year, making the terrain extremely dangerous. Almost 50 cars equipped with 4/4 engine are participating in the event that will culminate tomorrow. “Be around the light bringers, the magic makers, the world shifters, the game shakers. They challenge you, break you open, uplift and expand you… These people are your tribe,” these are the lines from the Facebook wall of Dr Sharmeen, a medical professional who is the only driver at a snow car rally in Kashmir.